Judge Dredd is a series whose tone became more refined over the years. The basic components were always there, Dredd was always a fascist lawman whose extreme measures are justified by an extreme environment, and the series has always been defined by a mix of science-fiction visionary, social satire and gorgeous art. The growth in the series is subtle, and you can watch most of it take place over the course of this first volume as it transforms from a glib one-shot intended to spoof Dirty Harry into a futuristic universe as rich and comprehensively realized as any other. The stories and the art are a lot wackier in the first half of this volume than in the rest of the Complete Case Files. The lines are a little looser and more cartoony and the writing reaches for the kind of dopey, groan-worthy self-referential jokes that Quentin Tarantino likes to sneak into his movies. For instance, consider the rule to never draw Dredd without his helmet. A scene in the comic has Dredd exposing his face directly to a group of thugs and to the reader, only to have it covered with a CENSOR bar. It’s a cute idea, but it’s not the kind of thing you’d see in later Dredd stories. The humor is often more overt, more goofy, and seemingly less confident in itself and the readers. Like Starship Troopers or Robocop, the later Dredd stories trust the reader to find the humor and the sarcasm inherent to these stories without any aggressive winking and nudging. This doesn’t mean that these are lesser Dredd stories. In fact, the goofiness sometimes allows the series to be a little more direct. 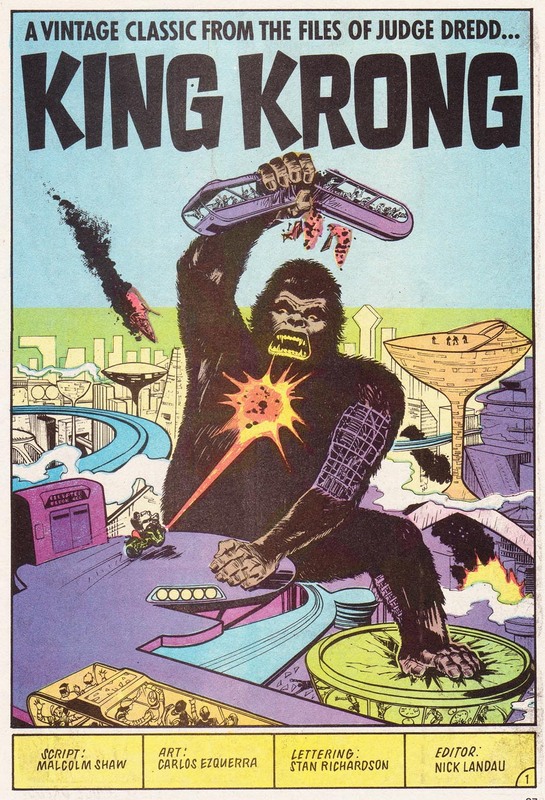 An early story in the book has Judge Dredd fighting King Kong. As goofy as this is, the even-goofier cover art does a fine job of summing up everything there is to say about Judge Dredd as a character as he sits in the palm of the ape’s hand, dwarfed by Kong’s enormous face, and informing him that he is being placed under arrest. This almost Hank Hillesque belief in what he’s doing, that a few honest lawmen can somehow contain a world that has long since given up on peace and order, is the romantic heart of a character who might otherwise be a bit too grim to root for, placing him closer to Superman than to The Punisher on the scale of cynicism. Everything you like about Judge Dredd is already there in the very first story, only a lot looser and a lot sillier, and it’s fascinating to watch the wackier elements of Dredd’s universe give way to a more believable (if never actually “realistic”) setting. The artwork in these stories is truly astounding. In the earliest stories, Carlos Ezquerra effortlessly achieves the cartoony violence that Frank Miller has been reaching for for decades, and some early work from Brian Bolland cements the Dredd universe as a believable setting. The writing is consistently good, although all of the very best Dredd stories would come later. We can read this first volume as a sort of tour-guide of the world of 2099 AD, getting us acquainted with the comic’s setting and setting the stage for the epic tales to come. Still, some early shorts really shine here. The Troggies has a truly creepy feel to it while You Bet Your Life is a grim look at the kind of entertainment that can exist in a world that places little value on the individual human life. The Robot Wars, the first real multi-issue spanning Judge Dredd story arc, while not without its bright spots, is a little overlong, focusing on an army of robot characters that are ultimately just not that remarkable. Later Dredd arcs have a truly epic feel to them where The Robot Wars feels like a one-shot stretched out to dozens of pages. Dredd starts out strong, it was never a weak series, but every story in the collection comes with the nagging feeling that you can’t wait to get to the really good material in later issues: the Wasted Earth stories, the Chief Judge Cal arc and Judge Death. It’s worth reading these early episodes to get a good sense of the world that Dredd exists in, but the series wouldn’t hit its stride for some time yet. Standing on its own merits, Judge Dredd: The Complete Case Files Vol.1 is a flat out 5/5. Compared to later volumes in the series, call it a 3/5. Yes, but not so much for the characters, as the comic didn’t rely heavily on plot arcs at this point, but to watch the tone of Judge Dredd evolve. Start with this one, skip around to whatever story interests you and then read the prototype Dredd story at the end. Unless you’re a completionist or you have the time to read the whole series, you can safely skip to The Cursed Earth, the first Dredd epic to cover over 20 episodes, and written at drawn after the series had really found the right tone. What trade is The Cursed Earth story arc in, and where would you suggest going after that story? Great review I think I might check out a trade or two of Dredd to see how I like it. Also how many vol. of the Case Files are there? Thanks. hey is this comic in color? Nice to see you take on Judge Dredd. I’ve been wanting to read it ever since the Stallone movie to know more about the world.